Throughout the drive, texts came in strong from Supu, Shugs, and others throughout the night inform us that HWY 88 was closed for the evening due to ice, and HWY 50 closed due to people driving up on their summer slicks. The final text came from Shugs at 5:30 am, stating that he finally arrived in South Lake. That made our 2:30 am arrival into Truckee seem like a heavenly adventure. After around 3 hours of sleep, we woke up to about a foot and a half of Tahoe’s lightest and driest, cool temps, occasional snow showers, and the occasional bluebird. 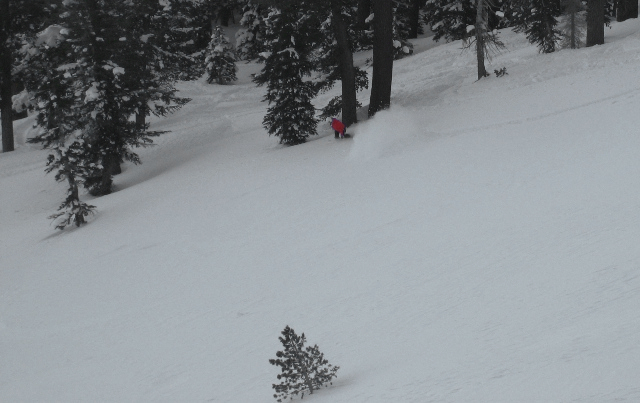 Most of the steep terrain did have a firm coating of concrete under the blanket of fluff, so it was a day to cruise the pow and have….well….a great time with your intern3t friends. Not many action shots due to the fact that I was following the leader for most of the day. Players: Slim, Lane Meyer, Basom, Oldtimer, Rob, NZ rider Skea_457, others, and myself. 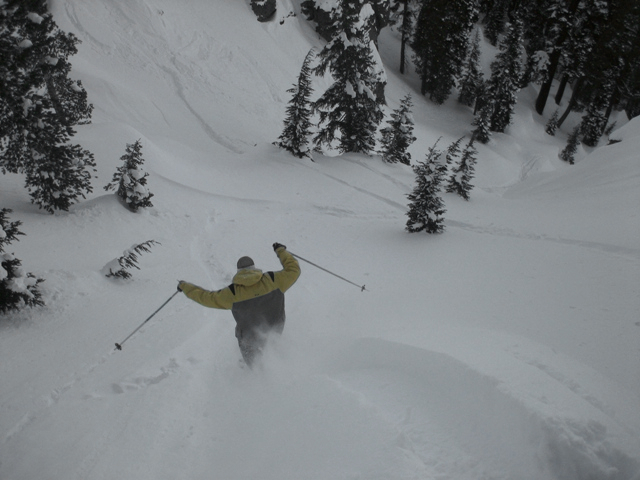 With Oldtimer acting as the guide, our Squallywood adventure started on KT22 with pow laps near Olympic Lady, which also included actually riding the Oly lift. Lane Meyer looking for his two dollars…. 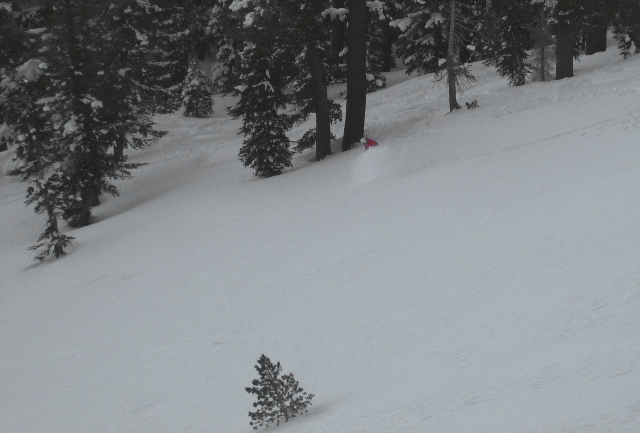 We ventured over to Granite Chief for a few runs only to find the Peak closed and Corkscrew shut as well. Over to Headwall, and we find Squaw’s most handsome skier, Basom. Sorry, no pics….he skis way too fast, or………way too slow….don’t know which. Needing to eat, drink, give a bluetooth lesson to Basom, and to say hello to some Kiwi Squaw implants, we headed over to Chamois. 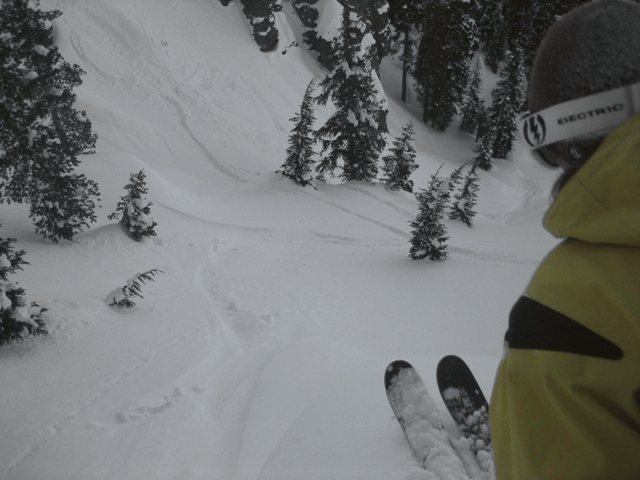 A couple more laps on Headwall and KT, we then called it a day. Huge thanks to Lane, Rob, and of course Oldtimer for the tour. 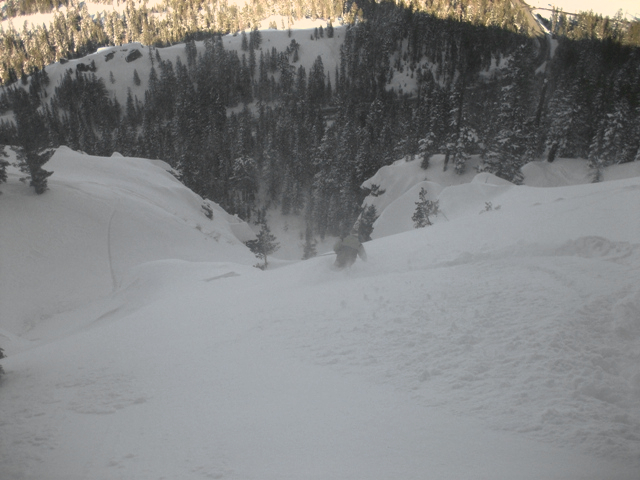 While at Squaw the previous day, we heard rumors and received texts by the powder hounds stating the skiing was just plain unbelievable. The storm fizzled out overnight, and only about an inch of new snow was reported. Hoping that the BC gates would read "Access," our day at KW would not disappoint. Players: Zippy, Jrosen32, Lou, Slim, Arty50, Shugs, buddy of Shugs, and myself. Zippy looking tight and doing a mid-air check for base damage…. For the same thing Arty wants….POWDER!!!! Up to this point, all the previous pics were shot INBOUNDS, the DAY after THE DAY, on a HOLIDAY WEEKEND. Now, here’s the permatographer making a rare appearance on the Spur to test stability…at 2:30 pm…..and untouched. Zippy drops in next….does it even look that good? 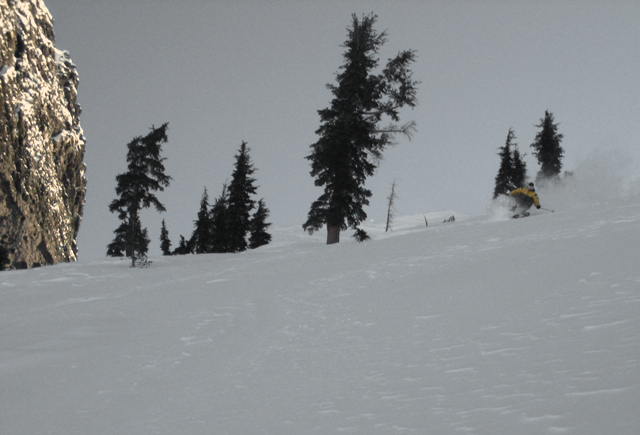 Zippy zips by on his 136 mm underfoot Moment skis…. …But wait….look who’s in the starting gate… L O U! 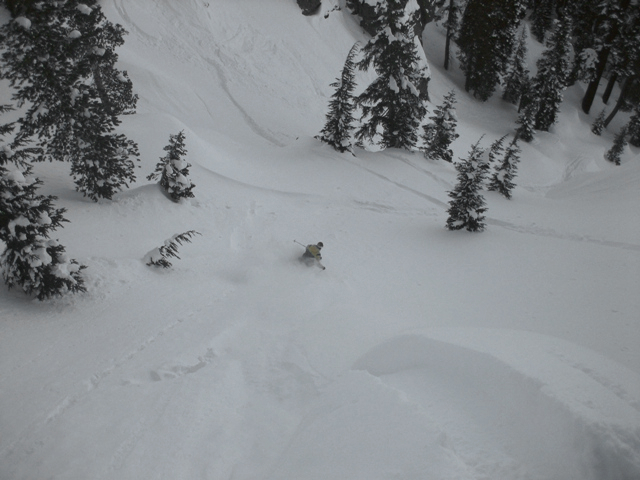 …and he’s hungry….HUNGRY FOR POWDER!!!!!!! 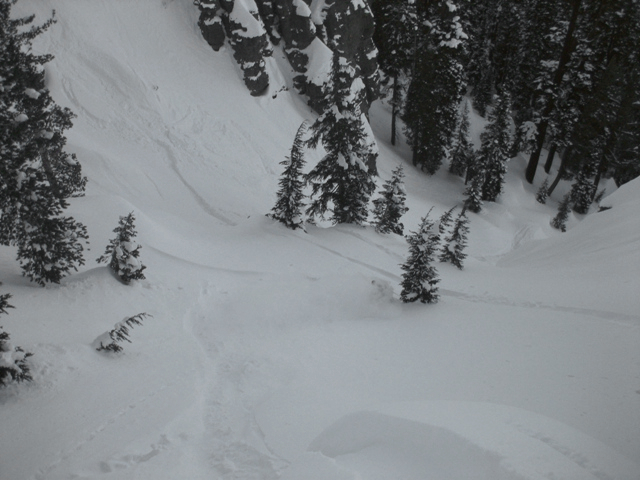 Jrosen32 lines up a cliff on the bottom of the Spur that we thought was 8 feet…. Zippy decides to ollie over the ice falls…. and finally, Permatogapher has a little fun…. I would say that this crowded holiday weekend ski day turned out pretty well, what do you think? Players: Zippy, Charlie (NZ’s most eligible freeskiing bachelor, two female members of the German snowboarding press, and myself, the tour guide to make sure "everyone has a good time." The weather consisted of a cool, crisp, bluebird morning with a hint of wind on the ridgetops…about 5 inches new, and the outside temp hit a balmy 0 F enroute to the mountain. Zippy trying not to scratch his unique skis…. I wonder what he’s listening to? German in red on Upper Sisters..
Charlie on a random ridge on Lower Sisters…. Thunder Bowl – a couple minutes later, we met up with a bloody-nosed border who said he got sloughed off the rock looker’s left of V-tree….if you look closely, you can see that he went big. For the last run, we decided to take a leisurely walk to the Spur…hell it was good yesterday. The Wall and California Chutes in the background. Made it to the First Sentinel…the wind created some icy conditions on top of the Spur, so the girls decided to hit the shaded trees skier’s right of Sentinel #1. As a tour guide, its nice to give your clients the goods…. but buttery goodness the last 2/3 of the way down. super nice….the choke at the end of the Spur is almost filled in. It still has about a 5 foot mandatory air that may freak people out that have a no air policy….just FYI. A quick ride down Merrill street, and the time is 4:15pm…not a bad way to end the day.